Moving a step closer toward quantum computing, a research team in the Netherlands recently fabricated a photodetector based on a single nanowire, in which the active element is a single quantum dot with a volume of a mere 7,000 cubic nanometers. The device is described in the American Institute of Physics' journal Applied Physics Letters. Photodetectors based on single quantum dots are expected to find uses in optoelectrical interfaces in future quantum computers, where single photons will carry information over long distances and single electrons will be used for computation. "Our research team fabricated a very localized light detector with dimensions far below the wavelength of light, which enables detection with very high spatial resolution," explains Val Zwiller of the Kavli Institute of Nanoscience at Delft University of Technology. "In addition, because quantum dots have discrete energy levels, only light in resonance with the energy levels of the quantum dot will be detected. The indium phosphide (InP) nanowire was grown with standard epitaxial techniques and the quantum dot was obtained by sandwiching a thin segment in between with a lower bandgap. 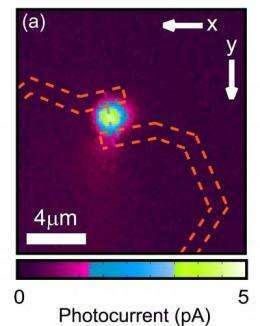 We created the device using electron beam lithography to contact a single nanowire."